GTA Online has become more outlandish over the years, and the newest Doomsday Heist only adds to the absurdity. Through this free update, you get to fly jet packs, drive submersible cars, and kill kill clone armies. It’s exciting enough that I’ve noticed a lot of players booting up the game again after being away for a long time, only to balk at the in-game price tags. The basic setup for The Doomsday Heist is that Lester and you are working to save the world from total destruction. Surprisingly, all three of the available missions are narrative-focused, with each one moving the larger story forward. Considering how dull the previous missions in GTA Online were, Doomsday Heist is a great improvement. All told, it took me about nine hours to play through the new additions. Before you can begin doing these new missions, you need to purchase a facility. The cheapest facility will still set you back over a million dollars, which can take a few hours of grinding old heists or missions to earn. GTA Online updates have long been filled with expensive properties and toys, but this new update is in many ways a follow up to the fan favorite “Heists” update. Back then it only took a $200k apartment to start heisting. These new heists, which involve jet packs and Mt. Chiliad mysteries, cost five times as much as much. Anecdotally, I’ve had a number of friends come back to GTA Online since this update dropped, and on Steam, concurrent players are particularly high of late. People are coming back—except the GTA they know has changed. Everything is more expensive now, and these players don’t have the in-game cash to jump right into the cool new stuff. While players can rely on invites from others who can afford the new content, my friends who play GTA Online keep venting about how expensive the facility is and how they would rather spend their limited funds on fun toys and vehicles. Since I play the game regularly and am frugal, I was able to buy the cheapest facility way up north for $1.25 million. While it’s affordable, the fact it’s nearly a 5 minute drive away from the city, where many of the prep missions happen, makes it feel like Rockstar is punishing players for being penny-pinchers. Facilities closer to the action cost nearly $3 million. Once you can take them on, you discover that these aren’t actually ‘heists.’ Yes, they operate like heists in that they have set-up missions, and the leader has to split the earnings, but the quests aren’t about robbing anything. Instead, the heist structure is used to create multi-step missions, all building towards a big finale mission. There are three “heists” in the game, broken into three acts. Each act contains setup missions, which were found in the old heists, and prep missions, which are new. Setup missions in The Doomsday Heist are more elaborate and exciting than most previous setup missions. At one point, my crew was ambushed by invisible super robots and had to fight them off using infrared goggles. Another time, we drove hovering cars that look like The Delorean from Back to The Future, and used them to trek across across water and land—all while blowing up armored trucks, of course. Prep missions, on the other hand, are where The Doomsday Heist slows down and starts to kill the fun. These new prep missions take place in the open world, with other players in the lobby able to screw with you and your teammates. Most of these missions are simple, like requiring you to drive to a spot and steal something to bring back to your facility. It’s boring. Worse, these missions are filled with long drives that became infuriating as other players attacked us and forced us to restart everything. It is possible to skip these prep missions, but it costs $95,000. Once players have done all the setup and prep, they gain access to a lengthy and action-packed finale mission. One of my favorites is the final mission where players get to escape a secret military facility inside Mt. 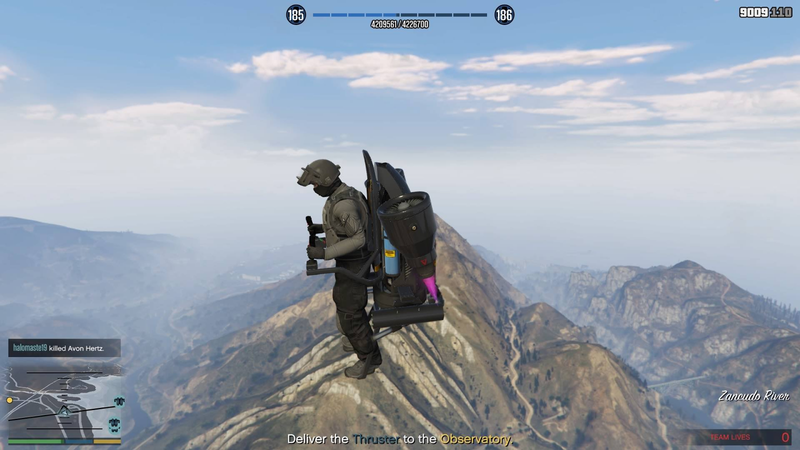 Chiliad via jetpacks. The jetpacks feel like small and dangerous helicopters. They pack rocket launchers and are tricky to control. After years of waiting, the jetpack doesn’t quite live up to the hype. This is especially true after enjoying the GTA San Andreas jetpack, which was faster, cooler, and could be unlocked with a cheat code. Appropriately, Lester mentions always wanting a jetpack, though once he sees them he isn’t all that excited or impressed. As I finished heists, my underground facility filled up with souvenirs and plaques from each heist—a nice touch. The facility feels so empty at the start and these trinkets helped make the place feel interesting. Of course if you really want to make the facility more interesting you can invest in a $900K orbital laser platform. Firing this laser costs $500k, but it also allows you to kill a large group of players. Honestly, it’s an incredible feeling, but I won’t do it often. It’s expensive, can rack up millions of dollars in costs, and if you miss, you don’t get your money back. The Doomsday Heists offer some much needed new co-op content that are not only fun, they also provide great new ways to make more in-game money. Doing all of the heists now in the game and splitting the cash evenly can earn players each about $1.4 million, not counting bonus cash you earn for for playing on hard or finishing the heists for the first time. I’m also impressed that four years into GTA Online’s lifespan, Rockstar is still pulling out the big guns when it comes to creating new content for GTA Online. It’s wild to think the game is still alive, and that even more content is coming down the pipeline in the future—but hopefully it doesn’t keep ballooning in price.